German Phil Bauhaus claimed his first World Tour win with victory on stage five of the Criterium du Dauphine. 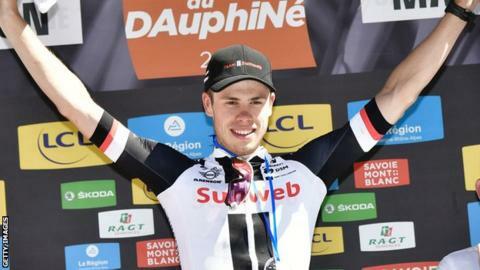 The Sunweb rider, 22, won the sprint ahead of Frenchmen Arnaud Demare and Bryan Coquard on the 175.5km stage from La Tour-de-Salvagny to Macon. Belgium's Thomas de Gendt retained the overall lead, 27 seconds ahead of Australian Richie Porte. Britain's Chris Froome of Team Sky, the defending champion, is sixth, still one minute four seconds behind. Thursday's stage was the last opportunity for the sprinters before the race heads to the mountains for the final three days. "It feels really good. I'm super happy that everything worked out today," said Bauhaus. "At the Giro d'Italia, I came close to the podium twice. Now with the support of the team, I take the biggest win of my career so far." Stage six takes the riders 147.5km from Villars-les-Dombes to La Motte-Servolex. The Dauphine ends on Sunday and will be the final competitive outing before next month's Tour de France for many of the riders. Froome is aiming to win the Tour for a fourth time this summer, with each of his previous victories in 2013, 2015 and 2016 preceded by winning the Dauphine.